With a name like Plush Tents Glamping, we were hoping for some serious creature comforts at this glamping getaway in West Sussex... and we weren't disappointed. 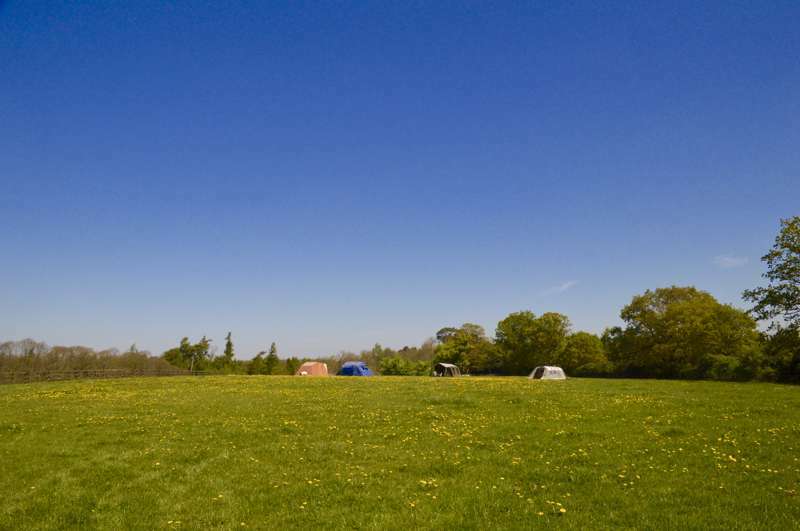 Nestled in woodland at the foot of the South Downs and close to the historic city of Chichester, this small but perfectly formed off-the-grid campsite at Densworth Farm offers beautiful yurts and bell tents set amongst trees and wild flowers in a picture-perfect spot. With a range of different sized canvas creations to everyone from suit camping couples to families of up to four, each 'plush tent' comes lovingly prepared and waiting for you on arrival, complete with proper beds and all the bedding. 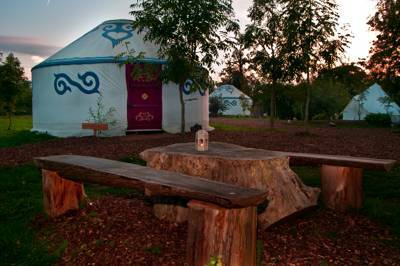 For large groups there's the Mongolian-style Family Yurt decorated with ceiling drapes, natural coir flooring, scatter cushions, cosy blankets and an oak double bed (plus two floor mattresses that are ideal for kids). The antique wood burning stove adds to the authenticity and a hamper with tea and coffee making kit is an added thoughtful touch. The Family Bell tent is decorated with natural coir flooring, a memory foam mattress on futon base with two floor mattresses for the children. The tent is equipped with a coffee table, torch and sheepskin rug. There is also a smaller Friends Bell Tent that sleeps up to three adults. Teaming up with Michelin-trained chef Sam Mahoney, Plush Tents offer glampers a delicious selection of breakfast and picnic hampers, freshly prepared and delivered to on the morning/day of your choice – the perfect way to kick-start your day. Then every evening a bonfire is lit which you can gather round with fellow guests and while away the hours. There's even a wood-fired hot tub to soak in – didn't they tell us this place was plush? 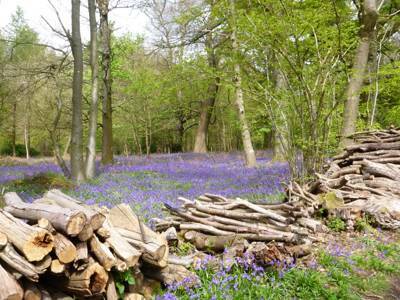 Set in the rolling West Sussex countryside there's plenty of local exploring to be done. Take a stroll and see if you can spot or, if you're lucky, hear Densworth's resident green woodpecker. Why not take advantage of mother nature's larder and arrange a foraging walk to collect your wild ingredients for a campfire feast. The Plush Tents team can point you in the right direction. Whether you're after a romantic break, a fun-filled weekend with the family or a group getaway from the big city, Plush Tents provide the perfect combination of back-to-nature camping with fuss-free glamping. So go on, treat yourself. Experience the last word in luxury camping. Our beautiful yurts are equipped with plenty of modern creature comforts and make great spaces for social gatherings of all kinds. 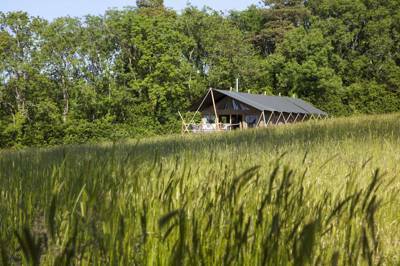 We have a wood-fired hot tub, hammocks, cinema tent and a natural play area with mud kitchen. 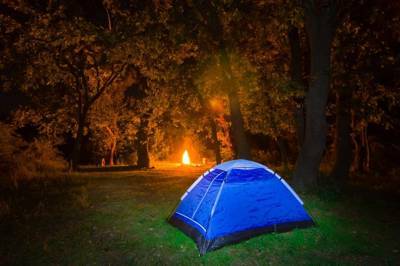 The whole campsite can be hired to host wedding receptions, hand-fasting ceremonies and birthday parties. Romantic, relaxing breaks, fun-filled weekends with the kids, walking with your dog, relaxing in the hot tub, clay pigeon shoots, or simply a stroll in the countryside… we’ve got the lot and can’t wait to share it with you! 2 showers, wood-fired hot tub, 2 WCs plus 3 eco toilets. Communal kitchen tent with cutlery, crockery and utensils. Hammock circle and bandstand communal space. Bonfire every evening. Clay pigeon shoot fourth Sunday of month. See website for full events schedule and prices. The famous Goodwood Estate (01243 755087) is nearby, with regular events including the piston-heads party Festival of Speed and Goodwood Revival. There are plenty of walking and cycling routes along the South Downs Way while Kingly Vale National Nature Reserve includes the country's oldest yew forest. Fishbourne Roman Palace (01243 785859) is the largest Roman home in Britain and makes for an interesting day out. Stanstead Park Country House (023 9241 2265) is an impressive Edwardian house with lovely gardens to enjoy. The sea is just a short distance away. Head for the sandy shoreline of West Wittering beach. The historic city of Chichester is a great place to wander, eat and shop. Plush Tents have teamed up with Michelin-trained chef Sam Mahoney to bring glampers a delicious selection of breakfast and picnic hampers, freshly prepared and delivered to you on the morning/day of your choice. Cooking facilities are provided onsite and each tent has a mini pallet kitchen. Plush Tents' exclusive caterers Field & Fork can create bespoke menus for large groups, such as an informal Fire Pit menu. If you fancy a nice pub lunch and a pint the Horse and Groom (01243 575339) is within walking distance. Chichester (10 minutes drive) has a large choice of good cafes, bars and restaurants. Open from April to end of October. Book three nights or more and get a 15% discount. The campsite entrance is on Chapel Lane, see map at this link. Directions from London: Come off the A27 at Fishbourne Roundabout, by taking Fishbourne Exit. Then, turn right onto Salthill Road and continue to end of the road. Turn left onto the B2178, towards the village of East Ashling. Just after the sign for Oakwood School, turn right onto Chapel Lane, drive past St. Mary Sennicotts Chapel and continue down the track for 200 yards until you see a Farm Gate on your left, signposted ‘Densworth’. Parking is sign-posted and located in the field on your right.